Please enter your name and email below to acess our audio downloads. 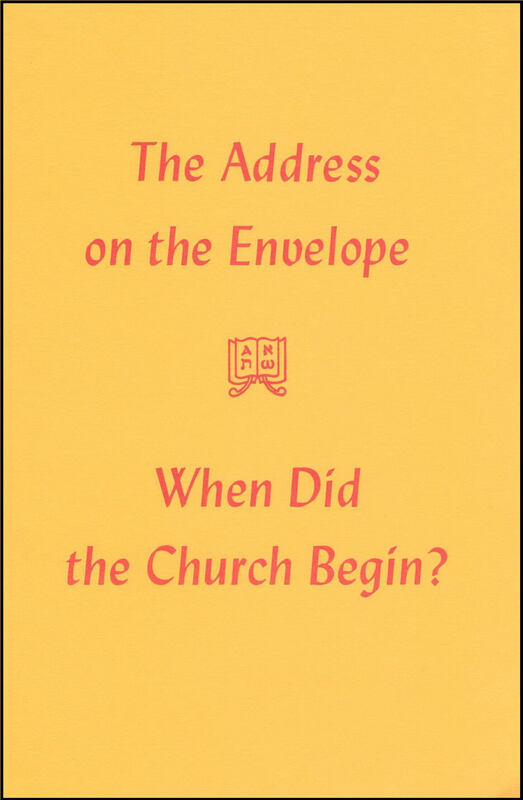 The Address on the Envelope / When Did the Church Begin? Two separate studies are included in this booklet. The first, The Address on the Envelope, explains that the historic, prophetic and literary portions of Scripture are usually in the form of short scrolls. When Did the Church Begin? is a study centered in the book of Acts, answering the question asked through its title, giving special attention to the significance of Paul’s being “severed” (Acts 13:2), with a view toward establishing the ecclesia which is Christ’s body, beginning the ecclesia as it is today. Two separate studies are included in this booklet. The first, The Address on the Envelope, explains that the historic, prophetic and literary portions of Scripture are usually in the form of short scrolls. God’s latest and highest communications have come to us in the form of letters or, if more formal or of a public character, epistles. The epistolary portions of the Scriptures are usually introduced by some specific indication as to the person or persons from whom the epistle comes and to whom it is directed. Knowing this and applying this principle in a practical way will be of great help in learning to “correctly cut the Word of truth.” When Did the Church Begin? is a study centered in the book of Acts, answering the question asked through its title, giving special attention to the significance of Paul’s being “severed” (Acts 13:2), with a view toward establishing the ecclesia which is Christ’s body, beginning the ecclesia as it is today. We will inform you via email of any updates of interest, such as new products or new pages. This signup is not to be confused with creating an online account, which is accomplished during checkout. The content on concordant.org is representative of many years of work by those closely involved with CPC. It is available to computer and mobile device users all over the world, but we guard it carefully as the ministry God has given to us. Therefore, items available on our website are available for personal use only. Distribution of materials either in electronic form or printed form is strictly prohibited. Any website is free to link to our CPC pages, but never to copy and display CPC content on their own website. CPC respects the intellectual property rights of others and we kindly request that others respect our wishes. For further clarification, please read Luke 6:31.